Home » Date and Location » A-Kon® 26 at the Hilton Anatole Hotel & overflow hotels. Hotel reservation will be via telephone (per the contract) at (800) 245-8918 and asking for the group rate under the name of A-Kon 2015. Overflow Hotel Info coming soon. For our 26th anniversary convention, A-Kon® is proud to once again be partnering with the Hilton Anatole Hotel. 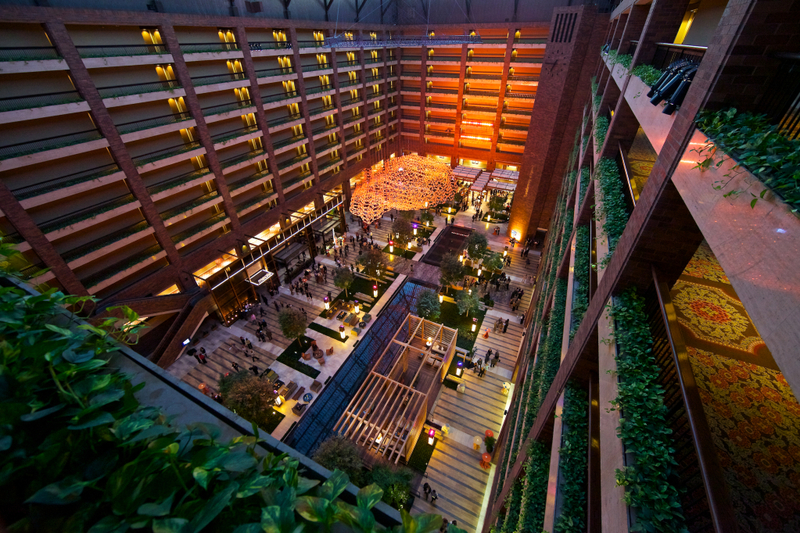 The Hilton Anatole has over 1,600 guest rooms and is one of the largest hotels in the Southwest. Each guest room will come fully equipped with the standard amenities ranging from hair dryers, irons, ironing boards, coffee makers, ice buckets, among others. The Anatole has a fully enclosed seven acre park on the grounds, including a jogging track and an outdoor swimming pool. The hotel has more meeting space than any other hotel in the area, as well as wonderful hotel rooms, including several different types of suites. The Hilton Anatole is a hotel located at 2201 North Stemmons Freeway Dallas, Texas 75207 in the Dallas Design District near downtown Dallas, Texas. Or by calling the hotel directly at 214-748-1200 or 1-800-445-8667 If you call, be sure and mention A-Kon® to receive our room rates. The rooms are located in either the Atrium or Tower. Premier Suites – One bedroom suites offer a choice of either two queen size beds or a king size bedroom, along with a spacious connecting parlor room that offers a murphy bed (a queen size bed built into the wall to provide an additional sleeping space). Studio King – These rooms have a king bed in them, with interior facing windows that do not offer an outside view. There are also several Grand Presidential Suites that can be rented as well. Please note that in the Tower, King Rooms have a shower and the Double Rooms have a bathtub. The pricing listed below is for rooms in either the Atrium or the Tower. Premier and Grand Pres. are only available by calling in, they can not be booked on the website. MINI BAR – Any items removed from the minibar in the room will be charged to your room. If you remove all the items from the minibar to put your own food/ drink in, your items will be removed when the staff services the room, in addition to being charged a $50 restock fee. GUEST ROOM SAFES – available in every room, check either in the closet or the dresser. GUEST ROOM INTERNET – $12.95 for a 24 hour period. It is complimentary in lobbies and restaurants. VENDING MACHINES – While there are not any vending machines in the hotel, the gift shops are well stocked with soft drinks and snacks. GUEST ROOM DEPOSIT – will not be charged this year. Your credit information will simply “hold” the reservation. ATM MACHINES – The Anatole is bringing back the multitude of ATM Machines – locations will be posted on the website as we get closer to Kon. A-KON APP – it will be back and loaded with lots of useful information. Details to follow! Once again, the hotel is not charging the one-night deposit when you make your reservation, and is also waiving the automatic incidental charge at check in. When you present a debit or credit card at check-in, please tell the agent whether you want “incidentals” turned on. Incidentals include: room service charges to your room, phone calls from the room, mini bar access, in room movies and parking automatically charged to your guest room. If you decide to have the incidentals turned on, your Debit / Credit Card will be charged $50 per day, per room unit “hold”. This is an industry standard to cover any incidental charges – movies, room service, phones, etc. Please note, the front desk will need to be told by you, at check-in, to make this change.